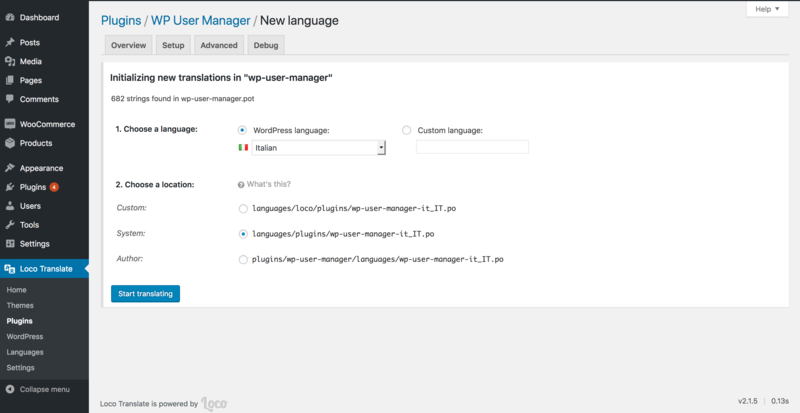 The following tutorial will teach you how to translate WP User Manager with the Loco Translate plugin. Loco Translate is a WordPress plugin for translating themes and plugins. It generates and compiles language files on the fly so that they're compatible with your WordPress website. Once you've installed the plugin, in your WordPress dashboard, navigate to "Loco Translate". Locate the "Running plugins" section and click on WP User Manager. 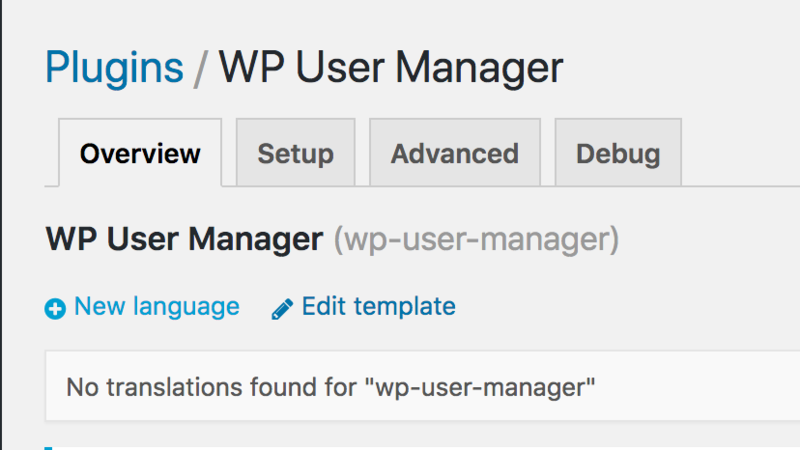 A new page will appear showing details about the WP User Manager plugin. Now click on the "New language" button to create a new translation. In the next screen, you need to select the language for which you need to create a translation. In order for your translation to work, your WordPress site language must be set up to the same language for which you're creating a translation. Your site's language can be selected under "Settings -> General -> Site language". For this tutorial we'll be using the "Italian" language as an example. When creating a new translation it's important that you set the location of the new language file to "System". Once you're done, click on the "Start translating" button. Now that your translation has been set up, you can start translating the plugin. An editor window will appear from which you can select strings that you want to translate. After translating all the strings that you need to change, press the "Save" button and your translation will start working.